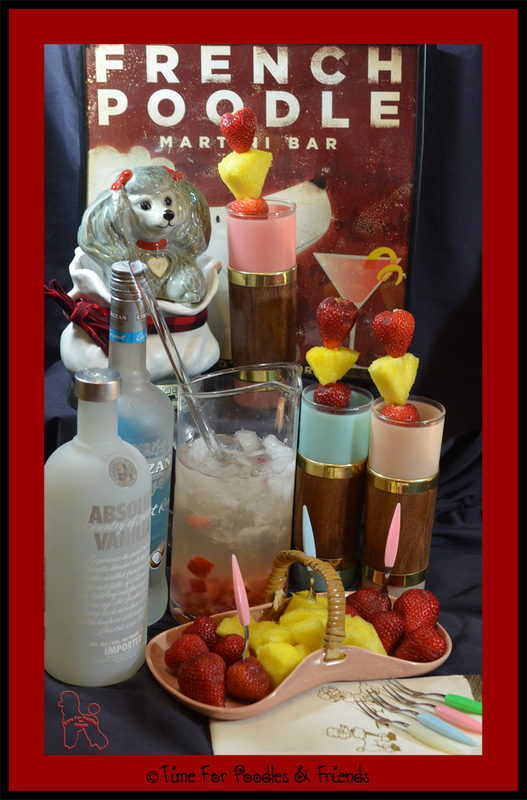 Welcome back to The Poodle Martini Bar, that imaginary and suave (OK, for me) establishment in my head. I have a new cocktail to share with you. My daughters and I concocted this during the 4th of July Weekend. We had some leftover strawberries and pineapple chunks and went from there. I was having trouble coming up with the name and Rachelle nailed it perfectly with Tutti Frutti Poodle. 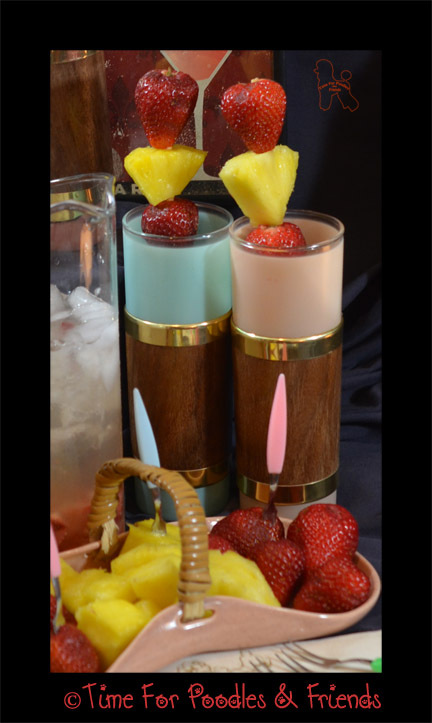 This is a light summer cocktail with and emphasis on pineapple, coconut, vanilla and fresh strawberries. I have two recipes. One is for a single cocktail and the second is for a pitcher full that is probably enough for four people. Mash a cut up strawberry in serving glass. Shake first four ingredients in a cocktail shaker with ice. Pour over the strawberries. 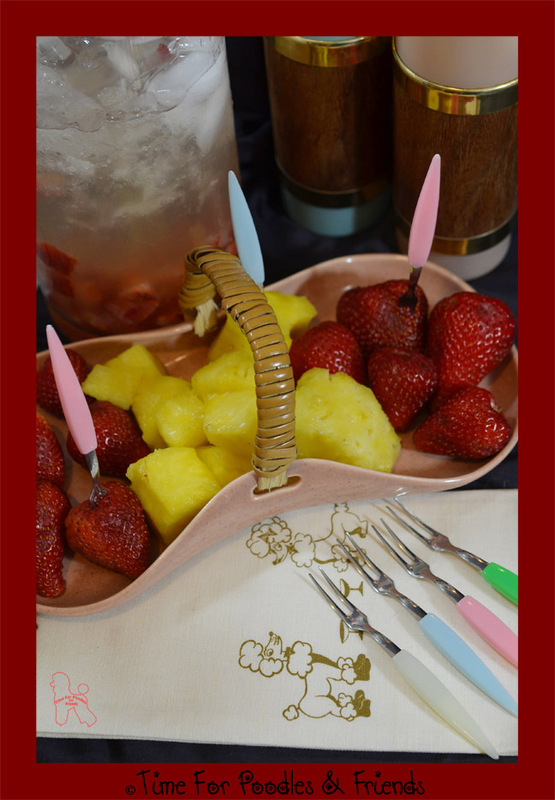 Add ice to serving glass and garnish with strawberries and pineapples on a stick. Mash cut up strawberries in serving pitcher. Add all ingredients in the pitcher. Add ice and stir. Pour into ice filled glasses. Garnish with strawberries and pineapples on a stick. For the threaded fruit, I just used bamboo skewers that I cut down. Even with my tall glasses I had to take about three inches off. Of course, the fruit is optional but it was a nice way to finish off the drink. I actually would eat a little fruit with each sip of the drink. * This is the recipe for simple syrup. It's easy to make. I keep it on hand in the fridge. Although, I like sour things, no one else around here does, so it's always, "that would be good if it was a little sweeter". In a small saucepan, bring the water to a boil. Remove the heat and add the sugar. Stir until the sugar is completely dissolved. Cool completely before using or refrigerating. Pour into a clean capped jar, cap tightly, and store in the refrigerator until needed. So now it's time to take a look at some of the vintage. The Fruit Dish is one of my favorite pieces from Russel Wright's American Modern. I wish the handle was in better shape but that was why I got a good deal on it and it will hurt it's resale value if that time ever comes. Most of my Russel Wright American Modern dishes are green but I mix a few pink in. I found the appetizer forks this year. Made in Japan, they match a set of Fondu forks that I have had for years. There is no date on with box, so I have no idea from what decade they are from. I would term the linen piece a bar towel rather than a napkin. It was very unique, so I decided it was perfect for my collection. Notice that there are Martini glasses sitting in front of each Poodle. These glasses were added about four years ago. I wanted something a bit different for Mai Tai and these Tiki styled glasses appealed to me. Some of the wood is cracked in a few places, but with vintage that is expected. I might try going over the wood with some orange oil; have no idea why I never thought of that before. And here is a close up of Tiffany. She is a vintage Jim Bean Whiskey decanter. 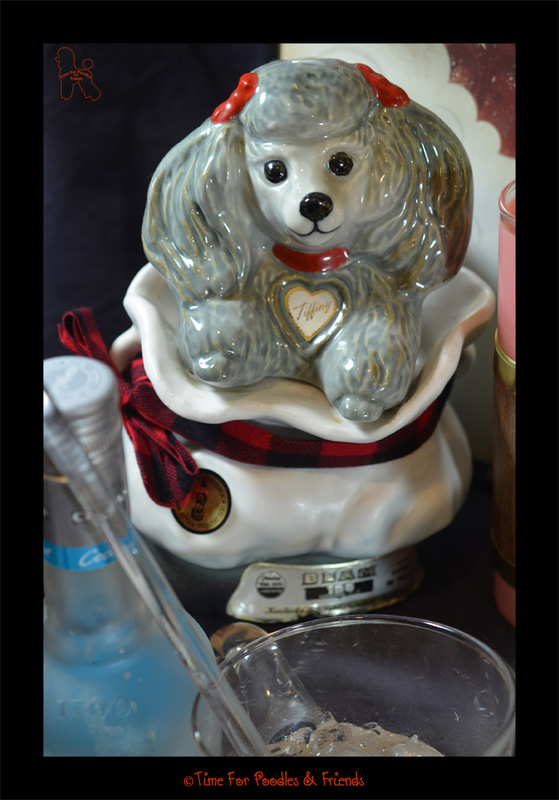 So far I only know of two Poodle decanters from Jim Bean. The other one I own is shown HERE. That finishes this Poodle Bar out. I hope you enjoyed my imaginary place. Take care and it's almost the weekend. Yea!